For a relaxing holiday immersed in the nature of the Maremma countryside, 20 minutes from the sea of the Argentario promontory and 20 minutes from the renowned spa Terme di Saturnia, the Farmhouse Poggio della Quercia offers a friendly and serene atmosphere, good home cooking and the comfort of four spacious rooms, each with its own bathroom and private entrance, and two apartments also equipped with kitchenette. There is also a lovely swimming pool for the exclusive use of our guests. The farm consists of a stone farmhouse dating back to early 1800, completely renovated, and of a newly built annex. 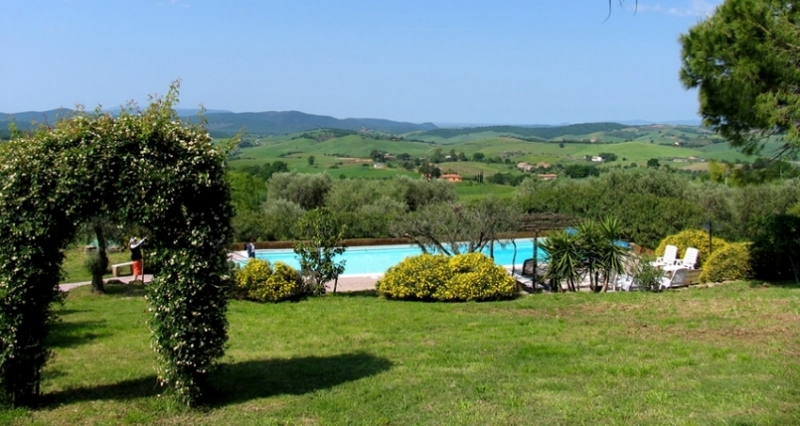 It is situated on a hilltop, overlooking a magnificent panorama in one of the wildest and most authentic places in the Maremma, far from the chaotic tourism, and where you can still enjoy the silence of nature. When walking or biking it’s quite easy to spot fawns, pheasants, hares, partridges, foxes or other wild game.